The Philippines which consists of a group of 7,100 islands(during high tide and 7,107 during low tide) is situated southeast of mainland Asia. It's location between the South China Sea and the Pacific Ocean made the islands a crossing point for migrating people around the world. Through the centuries, foreigners of different languages, ethnic cultures, and ancestries came, as invaders or mere traders. As a result, the Philippines became a country with diverse culture and heritage. 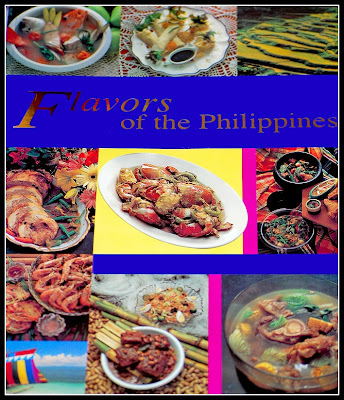 The Filipino cuisine therefore, just like the Filipinos, reflects the blending of these wide and varied cultures. Before colonizers came to the Philippines, the country's cuisine consisted of root crops, game, vegetables and seafood. Filipino food recipes then were just boiled, roasted or grilled. Malays were among the first inhabitants of the Philippines, and from them came the knowledge of preparing hot chilies and the use of ginataan , or coconut milk, in sauces to balance the spiciness. The Chinese on the other hand, who established colonies in the Philippines between 1200 and 1300, introduced the use of noodles. Now we have our own version of noodles called Pansit/Pancit which comes in a wide variety. Later came egg rolls, and soy sauce. It is also from the Chinese that we, Filipinos got the influence of using wide array of dipping sauces to accompany our dishes. When the Spaniards came in 1521, the food influences they brought were from both Spain and Mexico, as it was through the vice-royalty of Mexico that the Philippines was governed. This meant the production of food for which many ingredients were not locally available. Spain occupied the Philippines for almost 400 years, and therefore, had a major impact on Filipino cuisine. A majority of the dishes prepared in modern Philippines can be traced back to Spain. In fact, everyday Filipino dishes resemble Spanish cooking. The Spaniards introduced a Mediterranean style of eating and preparing food. Techniques such as braising and sautéing, and meals cooked in olive oil, are examples. Spain also introduced cooking with seasonings, such as garlic, onions, tomatoes, sweet peppers, and vinegar. The United States took control of the Philippines after the Spanish-American War in 1898, staying through World War II (1939–1945) until 1946. The U. S. military introduced goods shipped in from their country such as mayonnaise, hot dogs, hamburgers, and apple pies. Canned evaporated and condensed milk often replace the traditional buffalo milk used in desserts. They also brought to the Philippines the ways of convenience like pressure-cooking, freezing, and pre-cooking. Through the years, other global influences like that of French, Italian, Middle Eastern, Japanese, Thai, Vietnamese found its way to the Filipino cuisine making it a true gastronomic fusion of different countries and cultures from east to west. I've heard foreigners saying that Filipino food has food identity crisis. I beg to disagree. It's true that the many different cultures that colonized or inhabited the islands brought so much influence to our way of cooking. But we, Filipinos adapted them to indigenous ingredients and our local palate. We embraced our colonizers cuisine but put our Filipino touch in it which is a bold combination of sweet, sour and salty flavors, thereby making it our very own unique and mouth watering Filipino cuisine.